Sports do not exist in a vacuum. Rather, they reflect the times and societies in which they take place. The year 2018 has spawned numerous 50-year retrospectives of 1968—a chaotic year in American life, politics and culture—inevitably accompanied by a soundtrack that includes the Beatles’ “Revolution” and the Rolling Stones’ “Street Fighting Man,” which were recorded in 1968, as well as Buffalo Springfield’s “For What It’s Worth,” which was actually recorded two years earlier in 1966. It was no different in sports. The resetting of the political dial in 1968 was mirrored on the sports dial. The indelible image of Tommie Smith and John Carlos on the medal stand at the 1968 Olympic Games is a visual that captures the tension of the times as much as the lyrics to “For What It’s Worth” do. Other examples abound. In the summer of 1968, rising UCLA senior Lew Alcindor converted to Islam (it would be three more years before the public would know him as Kareem) and though he was already an NCAA player of the year with two NCAA titles under his belt, he refused to play for the U.S. team in the 1968 Olympics—for the same reasons Smith and Carlos raised their gloved fists in the air. Muhammad Ali did not have a fight between March 1967 and October 1970, having been banned from boxing for refusing his military draft orders. Ali, however, became a ubiquitous presence fighting battles outside the ring, and 1968 was the year when he began to migrate from heavyweight champion to cultural icon. In the Mexico City Olympics, we would get our first glimpse of heavyweight gold medalist George Foreman who, in contrast to Smith and Carlos, carried a small American flag around the ring after his triumph. Six years later, Ali would reclaim his stripped heavyweight title in a fight against Foreman. UCLA alum and 1st Lt. Arthur Ashe won the U.S. Open, as tennis majors became “open” by abandoning their amateur code. The U.S. Open champions are now crowned in Arthur Ashe stadium. Vince Lombardi coached his last game for the Green Bay Packers in the 1968 Super Bowl. The Tigers and Cardinals staged a memorable World Series featuring 31 game-winner Denny McLain and Bob Gibson, whose season ERA of 1.12 is now almost inconceivable. Major League Baseball would lower the mound for the following season, significantly shifting the advantage from pitcher to hitter. It would also be the last year that league winners advanced directly to the World Series—a second playoff round would be added in 1969. And the Stanley Cup playoffs were played for the first time in a venue west of the Mississippi (barely west—St. Louis) as the NHL finished its first season of expansion beyond the original six teams. 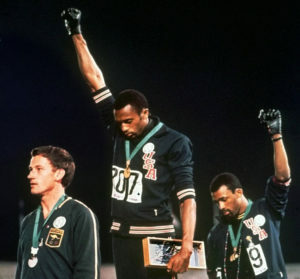 So while reflecting on the assassinations of MLK and Robert F. Kennedy, the divisive war in Vietnam, the riots at the Democratic National Convention in Chicago, Apollo 8 and the music that accompanied it all, it is worth realizing that sports was right there at the epicenter, reflecting the changing consciousness of a nation and of those who play and watch the games.